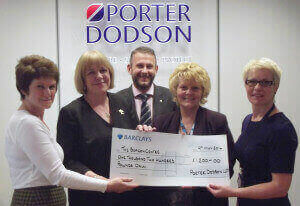 Porter Dodson’s Taunton office has raised £1200 for its 2013/14 nominated charity, the Beacon Centre. The money has been raised by employees holding monthly fundraising events and activities, such as dress down days and sponsored cycling. The Beacon Centre forms part of Musgrove Park Hospital and offers treatment to cancer patients. Prior to the Centre opening, patients had to travel to Bristol for their radiotherapy and some of their chemotherapy treatments. Whilst the Centre is funded by the NHS, it does work closely with charities and appreciates the additional support they offer patients. Jo Greedy, who is a representative of the Head and Neck Support team at Musgrove Park, explained that the money raised by Porter Dodson will go towards comfort bags for Head and Neck radiotherapy and chemotherapy patients to support them during and at the end of their treatment. The packs will include items such as skincare products, aids for nutrition and aids for oral hygiene and will be individually tailored to enhance the care of each patient.